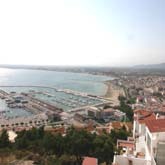 Roses is a tourist and seaman’s town situated northeast of Catalunya. If you choose to spend your holiday in Roses, you will enjoy some large beaches and secluded coves with clean and clear waters. You will also be able to practise every type of watersport (sailing, water skiing, surfing, etc.). 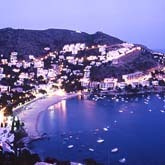 If you prefer, you can travel in the boats that do excursions to cap de Creus and also travel in a tourist train that will take you through places of an unforgettable charm. 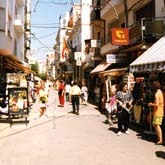 Roses has a complete infrastructure of apartments, hotels, camping sites, shops, discoteques and pubs. The Roses coast has a total of 19 beaches, some with more than 184.000 square metres of sand. The urbanisation of Santa Margarita has more than 18 kilometres of navigable canals. Roses offers its visitors the possibility to enjoy the nature of the small coves where you won’t hear a lot more than the whispering of the sea and the cry of the seagulls. At the same time, one can visit the Mallol house, monument to the fishermen, monument to the bay of Roses, monument to the tourist, the port, the maritime promenade, the lighthouse and the mountain viewpoint of the Puig Rom. On the gastronomical side, we present you with the typical dish: the Roses suquet.